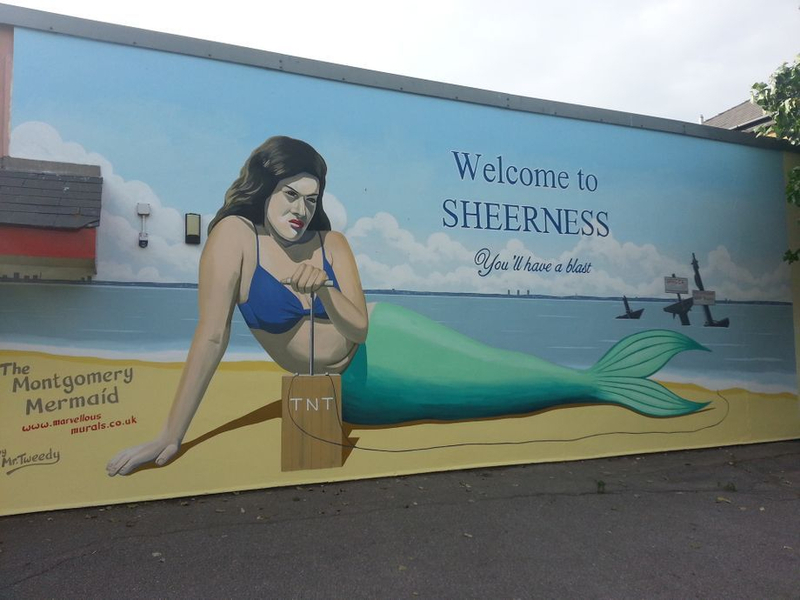 This mural was painted for the Sheppey Monsters and Myths Promenande. This took 4 days to paint, and caused quite a stir in the local and National news! There is a story behind this. When I was a boy I grew up in East Ham in London and we would go on holiday to Sheerness which was a popular destination for many Eastenders on their summer vacation. I always remember it as a vibrant exciting place full of colour. My Granddad was in the Navy during the war and afterwards he worked on the Estuary docks. He was a larger than life character and would tell me many stories about his exploits around the world. Some of the stories stretched the truth sometimes but they always kept me enthralled. On one of our holiday trips to the island I remember my Granddad telling me all about HMS Montgomery which was an American Liberty ship built during World War II. The ship was wrecked off the Nore sandbank in the Thames Estuary, near Sheerness in 1944 with around 1,400 tonnes of explosives on board which continue to be a hazard to the area today. He told me all about how dangerous it was and went on to tell me a story about a mermaid that swam among the wreck and kept an eye on it. He told me that we mustn't annoy the mermaid by getting too close to the wreck otherwise she will just set off the explosives. It left an impact on me. I've always had a fondness for the island and I like to get over there from time to time and create a bit of public art to brighten up the place and get people talking about this fantastic little seaside town as it has become quite forgotten in recent years. I wanted to create something this year for Promenade Arts Festival which is held on the island every year and when Chris Reed from Big Fish Arts told me that the theme this year was mermaids there was only one thing on my mind that I wanted to paint - The Montgomery Mermaid! I went for the saucy postcard look with the colours and I wanted to give her a bit of a scowl as I didn't want her looking all happy that there was this potential man-made disaster dumped in her home. I think if she had a smile on her face that would be even scarier. It certainly has got people talking! A man wrote a letter to the local newspaper complaining that he didn't like it and thought she looked like a terrorist. This got picked up by the national media and was shared across many platforms. Some of the comments online got really silly and the newspapers blew everything out of proportion but I was absolutely overwhelmed with the support and encouragement that I received from all that I met.